If You Want a Log Home, Shouldn’t it be Built Out of Real Logs? The size and quality of the logs will be obvious from both inside and outside your home…it’s the logs that will make your home stand out and this is what your family will appreciate for generations. A handcrafted log home contains nearly double the wood volume of a “machined-log” building, giving you greater structural strength and insulation value. If you like log homes you’ll love the raw strength and beauty of natural hand-peeled large logs, rather than the narrower processed “logs” typical in log cabin kits. Enjoy friendly service, high quality craftsmanship and no distributor’s mark-up when you deal directly with your log provider. We cheerfully answer your questions every step of the way as we build you a home that exceeds your expectations! Scribing the unique shape of one log to fit the next requires skill and experience, but the practiced hands of a master log builder work quickly and efficiently.Keeping this art alive, handcrafters combine traditional techniques with advances in modern tools, creating some of the most beautiful log homes in history at competitive prices. Each harvested tree is used entirely after it is hand-peeled when you choose a handcrafted log home rather than a machined log home kit…without the energy required or the wood waste produced by over-processing the tree. 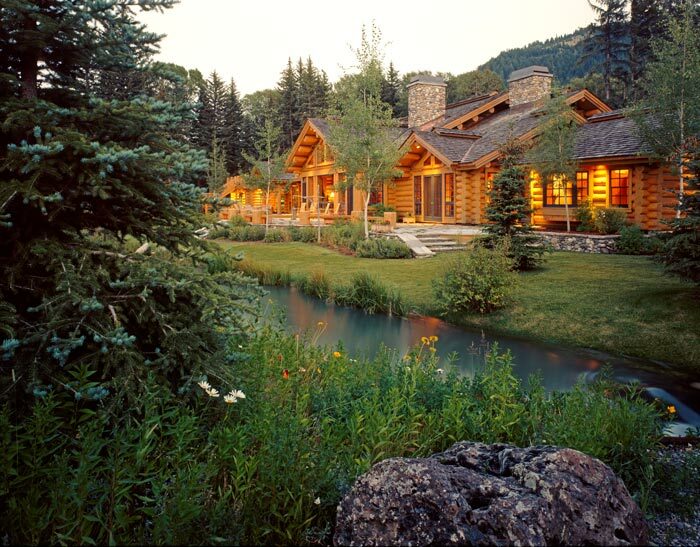 A custom log home allows you to choose the details that are important to you. Work with a designer to create the perfect log home plan or customize a basic plan to meet your needs! A custom build offers the most flexibility in budget and style. Choose precisely what you want in whatever price range you’re comfortable with…don’t settle for a log home kit that’s “close enough” when the options today are endless! It may be hard to accomplish something truly unique with a log kit home, but a custom log cabin lets you express yourself. Many of our clients ask for something a little different—we’ve built log homes around giant boulders and full sized trees—go ahead and challenge us!